Garmin GPSMAP 7407 is a Chartplotter and Fishfinder with 7-inch multi-touch windscreen display and comes preloaded with worldwide base map. There are two SD Card slots so that you can add additional maps to the device. There is a high-sensitivity internal 10Hx GPS/GLONASS that will update your position and heading 10 times per second. Using Wi-Fi you can also connect with a smartphone or tablet. There are two models: 7407 and 7407xsv. Only the 4707xsv features a Sonar though you will need to buy a transducer separately. 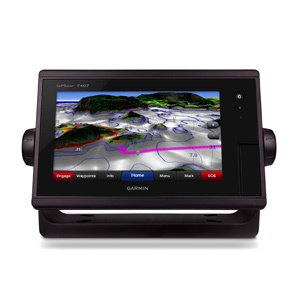 The Garmin GPSMAP 7407 is a 7-inch multi-touch widescreen display Chartplotter and Fishfinder which is ideal for both sailors and fishermen. It is preloaded with a worldwide basemap and you can add additional mapping such as BlueChart g2 and g2 Vision maps using the two SD card slots. The GPSMAP 7407 features a high-sensitivity internal 10Hx GPS/GLONASS which will update your GPS position and heading 10 times per second resulting in a very clear representation of your current journey. The are two models of the GPSMAP 7407 that you can choose to buy. These are the GPSMAP 7407 and the GPSMAP 7407xsv. The 7407xsv model additionally has a Sonar for fishing and bottom tracking purposes. 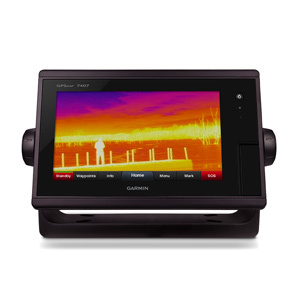 It features a dual-channel 1kW CHIRP and offers views below the water both below your boat and to sides of your boat. These views are named by Garmin as DownVu and SideVu. 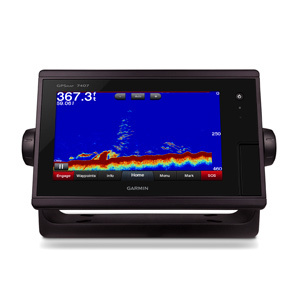 The capabilities of this Sonar are so great that you can see on your display small and closely spaced fish a fishing depths down to 1,500 metres. The maximum depth capacity is 5,000 ft at 1kW (this is dependent on water bottom type and water conditions). Please note that the transducer is sold separately. To find the perfect transducer to partner your GPSMAP 7407xsv and your boat please complete our online transducer form. Alternatively, if you know which transducer your require (we do however recommend that you complete our online form to find the perfect transducer) you can view the comprehensive range of transducers available buy from ActiveGPS. Pictured below, transom mounted transducer, thru-hull transducer and in-hull transducer. This Garmin Chartplotter is also Wi-Fi and ANT+ enabled. With the feature Garmin Helm you can control your Chartplotter from a smartphone or tablet. In fact, if you are using an iPhone or an iPad you can also record screen information from your GPSMAP 7407 Chartplotter/Fishfinder. You can also plan your route on your iPhone or iPad and transfer the data wirelessly to your Chartplotter making planning more comfortable and separate from using your Chartplotter for every journey planning activity. There is also FUSION-Link which connects to your entertainment System/Audio System direct to a compatible chartplotter. The Garmin GPSMAP 7407 can be synced with a marine network and NMEA 2000 which enables it to offer you radar, autopilot instruments, multiple screens, FUSION-Link, remote sonar modules, digital switching, thermal cameras, GRID rotary knob, joystick and keypad control. You can also share with other GPSMAP compatible Garmin devices information such as radar, GSD 24, GSD 26 sonar modules, supplemental maps, user data, waypoints, routes and tracks. It also supports connectivity using NMEA 0183. Sailing features include laylines, enhanced wind rose, heading and course-over-ground lines, true wind data fields and tide/current/time slider. Plus gauge displays provide coverage of true and apparent wind angle, set and drift, true or apparent wind speed, horizontal and vertical graphs and data bar with customisable data fields. 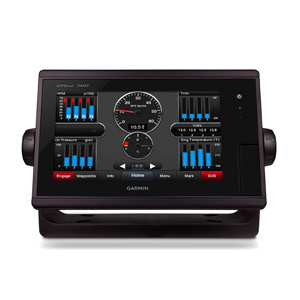 The 7407 Chartplotter is compatible with gWind Transducers. The benefit of gWind, gWind Wireless and gWind Race transducers are that they include twin-fin technology and 3-bladed propeller. This will connect to NMEA 2000 and compatible Garmin Chartplotters via the GND 10 black box bridge. The Garmin GPSMAP 7407 and GPMAP 7407xsv are both preloaded with a worldwide basemap. Additional detailed Garmin Bluechart g3 marine charts on pre-programmed microSD/SD card can also be purhcased from ActiveGPS. The very best and latest charts, named BlueChart g3 Vision include fpremium features such as high resolution satellite imagery of harbours, ports, etc, auto guidance, MarinerEye - keep an eye on 3D information above the waterline and FishEye - provides 3D information below the waterline. 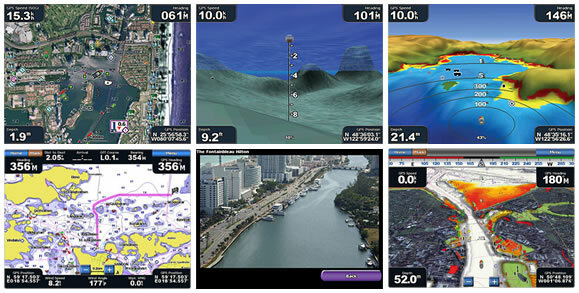 You can save up to 5,000 waypoints and 100 routes to your Chartplotters' memory. The GPSMAP 7407 is waterproof to IPX7 standards and will also record water temperature in a log and graph. ‣Wi-Fi and ANT+. Connect and control the GPSMAP 7407 with a smartphone and tablet. Also plan your route on your iPhone or iPad and transfer to your compatible chart plotter. Flush, Flat and Bail mounting options enable you to mount the GPSMAP 7407 device against most flat surfaces in your boat. 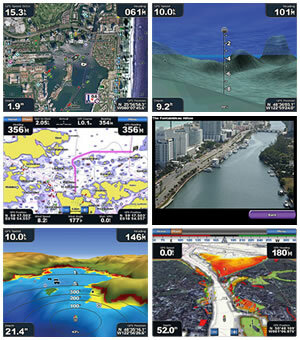 Garmin GPSMAP 7407 marine chartplotters are preloaded with a worldwide basemap. 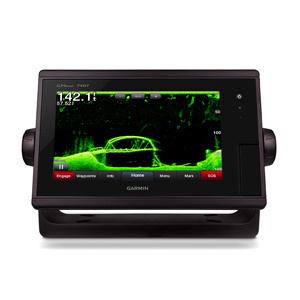 Looking for Garmin GPSMAP 7407 or GPSMAP 740xsv accessories? Accessories available to purchase include protective cover, bail mount with knobs and flush mount kit. If you'd like to add a transducer to your GPSMAP 7407xsv please see Garmin transducer page. Add Garmin BlueChart g3 and g3 Vision marine charts to your Garmin GPSMAP 7407/7407xsv, view the different Garmin BlueCharts you can buy from ActiveGPS. ‣Basemap: None. Preloaded with worldwide basemap.